I know the trend has been around NYC for a few years now, but I’m just getting around to it now. In case you don’t know, Bahn Mi are Vietnamese sandwiches made with a small French baguette. I have always had a vietnamese restaurant on my list-of-places every where I’ve lived since I first moved out of the parents house. One of two of them have even had sandwiches, but none of them struck me as anything special. Thinking back, I think they were just standard ham/cheese subs or something. For a couple years now the Bahn Mi trend has been going through NYC, but I never got around to trying one. 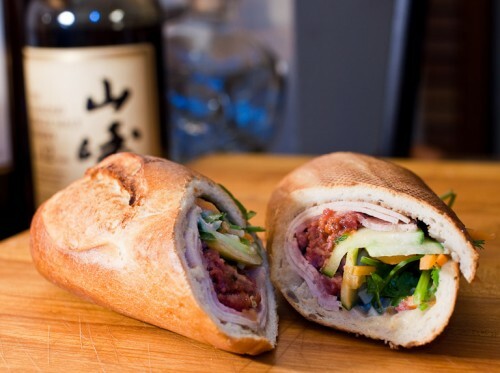 I still hadn’t found my Vietnamese place for the West Village until Baoguette opened a Christopher Street location. They have the normal Pho and B’un stuff in the back, but they have a section up front which is their “Bahn Mi Bar” Their standard “Baoguette” sandwich seems to be the best one. I’ve eaten 2 or 3 of them over the past 2 weeks and I just got around to looking at the ingredients today. “Pork Terine, Pate, Pulled Pork, Fresh Herbs” My first bite into it yelled out “Vietnames-eey!” I think the combination of cilantro, cucumber and bean sprouts just makes me think Vietnamese food. I love how this new food pulled out a feelings from memories! These sandwiches totally jumped into my top 10 list.